When a new name passes in front of us, we like to be able to say, oh yes she’s that kind of performer. 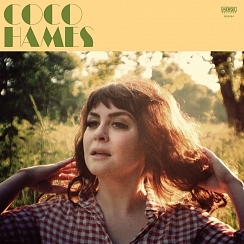 Listening to this first record from Coco Hames I’m left with a good feeling and no real idea where her future lies. She certainly showcases a broad range of styles across these ten songs; the closest thing I can think of is Zooey Deschanel and M. Ward’s She & Him project, where they explored across the genres and the decades. Hames starts with When You Said Goodbye, something that resembles both sixties pop in the vein of Hermanns Hermits and also wonderfully the Go-Betweens – the plangent guitars are a dead-ringer for Robert Forster – then she moves onto to classic girl-group territory with I Do Love You before wonderfully diverting into pop-punk with the Ramonesy I Don’t Wanna Go. Dusty Springfield is conjured up with You’re Calling Me, a sultry slow-burner, country rock come a calling for This House Ain’t a Home and the closing Dead River piles on the drama and sounds like she had help from Ennio Morricone. She gets help from John McCauley of Deer Tick on the dissolute duet Tiny Pieces that was written by the Replacements’ Tommy Stinson and bears all of the hallmarks of that great band. You might worry but you need not as the performance does absolute justice to the source material. Hames is a performer of force and charm – this record may not tell us very much about where she might go in the future but it shows us where she’s from, and I for one, will be waiting to see where she does go next.